Since mid-2014, fighting in Yemen has raged between Houthi militia forces and a loose coalition of groups nominally loyal to the government of President Abdrabbuh Mansour Hadi. Full-scale war broke out in March 2015, when an international coalition led by Saudi Arabia and backed by the United States, United Kingdom, and France, began conducting air strikes against Houthi forces. What little international policy attention the region has received has focused largely on Western support for the coalition and the burgeoning humanitarian crisis and looming famine affecting most of Yemen’s 29 million residents. The highly publicized October 2018 killing of Saudi journalist Jamal Khashoggi in the Saudi consulate in Istanbul focused attention on the ravages caused by the Saudi-led bombing campaign, leading policymakers in the United States and United Kingdom to reevaluate their involvement. However, analyses of the civil war’s humanitarian and geopolitical implications often overlook Yemen’s role as the epicenter of one of the world’s busiest mixed migration routes, linking Africa, Asia, and Europe. Indeed, Yemen is rarely a focus of debate on international migration dynamics, even though the country saw more irregular maritime crossings in 2018 than all routes across the Mediterranean combined. This article will highlight the principal migration pathways to and through Yemen, the push and pull factors driving regional flows, and finally the impact of the civil war upon those on the move. Recent migration trends in Yemen have important implications for broader understandings of mixed migration, challenging several commonsense assumptions about the factors and conditions that drive mixed flows of people fleeing persecution, seeking better lives and opportunities, or who are victims of trafficking. Most of the migration to Yemen originates in the Horn of Africa and is organized around three principal routes. Migrants on the Northern/Northwestern route pass through Sudan to Egypt or Libya, with many continuing by boat to Europe. The Southern route crosses Kenya on the way to southern Africa, and often South Africa. Those on the Eastern route—the most popular and most studied of the three—cross into Yemen by boat, and onward to Saudi Arabia, other Gulf States, and the Middle East. The Eastern route is itself made up of two pathways: one across the Red Sea from Obock in Djibouti, and another across the Gulf of Aden from Bossaso in Somalia. Since the UN High Commissioner for Refugees (UNHCR) began gathering data on crossings in 2006, flows along the Eastern route have been comprised almost entirely of Ethiopians and Somalis. Initially, Somalis were the largest group, making up 55 percent of all maritime crossings into Yemen in 2006, and 66 percent in 2008. Irregular migration from Somalia grew following the collapse of the central Somali state in 1991 and more than two subsequent decades of civil conflict. Yemen has traditionally adopted a welcoming attitude towards arrivals from Somalia and has accorded Somalis prima facie refugee status since 1988. As a result, the number of Somali refugees in Yemen has climbed steadily. Source: UN High Commissioner for Refugees (UNHCR), "Population Statistics: Persons of Concern," accessed December 20, 2018, available online. A new central government was established in Somalia in late 2012, and the number of Somalis crossing along the Eastern route has fallen as the political situation has improved, although armed groups continue to operate in the south of the country. While political conditions have ameliorated, economic factors, including lack of livelihoods and recurrent droughts, continue to drive flows from Somalia. The country experienced a devastating drought-induced famine in 2010-12, killing an estimated 250,000 people. More recently, droughts induced by the 2015-16 El Niño phenomenon led to large-scale displacement in the northern territories of Puntland and Somaliland as a result of food insecurity and death of livestock. Since 2008, Ethiopians have comprised the largest group making the crossing into Yemen, making up 89 percent of all maritime crossings in 2015. Migration from Ethiopia has been driven by a lack of economic livelihoods in combination with political instability. Like Somalia, large parts of the country have experienced drought conditions since the El Niño-induced drought. At the same time, the country’s two most populous regions—Oromia in the south and Amhara in the northwest—have been the site of mass demonstrations against development policy, political repression, and human-rights abuses since November 2015. A government crackdown in response to the initial protests in Oromia was followed by the declaration of a state of emergency and martial law in October 2016 after the unrest spread to Amhara. After being suspended and briefly reinstated, the state of emergency was finally lifted in June 2018 by Prime Minister Abiy Ahmed, who also announced a wide range of political reforms. While this political instability is one driver of migration flows from Ethiopia—in March 2017, 90 percent of Ethiopian nationals encountered in Yemen identified as Oromo—the majority of Ethiopians crossing into Yemen do not do so to claim protection, and the number of Ethiopians recognized as refugees in Yemen is negligible (see Figure 2). This is due in part to the comparatively hostile attitude adopted towards irregular Ethiopian migrants by the Yemeni authorities. Until March 2010, the Yemeni authorities did not recognize Ethiopians as legitimate asylum seekers, instead arresting and deporting those apprehended upon landing in Yemen. While this policy was changed to allow Ethiopians to lodge asylum applications, the majority of Ethiopians in Yemen—98 percent of those surveyed by the Mixed Migration Centre (MMC; formerly known as the Regional Mixed Migration Secretariat) in January 2017—continue to cite primarily economic motivations for migrating, including a desire to seek employment in Saudi Arabia. Employment opportunities in prosperous Gulf States, often as domestic or farm laborers, continue to act as the largest pull factor for migrants on the Eastern route despite a succession of deportation campaigns launched by the Saudi government since 2013 targeting irregular immigrants. However, mass expulsions of migrant workers from Saudi Arabia in 2013 did coincide with a drop in maritime arrivals to Yemen in that year. The most recent campaign, which began in November 2017, has led to the deportation of more than 500,000 migrants in one year, according to Saudi government statistics. In addition, large numbers of Ethiopian migrants returned from Saudi Arabia during an amnesty period prior to the campaign. The outbreak of full-scale civil war has added a myriad of dangers to a migration-transit country already fraught with risk. Migrants have suffered direct attacks from warring parties; in one March 2017 case a coalition military vessel and helicopter opened fire on a boat carrying around 140 Somali migrants off the west coast of Yemen, killing at least 42. Once in-country, migrants have faced increased logistical challenges on their journeys despite a breakdown in border enforcement. For example, in 2015, heavy fighting around the key transit points of Sadah and Hajjah in the north made crossing into Saudi Arabia difficult, due in part to the withdrawal of people smugglers from the area. The conflict has led forces on both sides to adopt increasingly anti-migrant practices, possibly due to fears that migrants will be recruited or exploited by enemy forces. Since 2015, there has been an increase in reports of migrants of all nationalities being detained, abused, refused access to asylum procedure, and deported en masse by both Houthi and pro-government forces. This is a reversal of Yemen’s traditionally welcoming attitude towards Somali refugees, as well as the moves in the years preceding the war to recognize asylum seekers from other nationalities. Nongovernmental organizations working with migrants and asylum seekers in Yemen have also encountered difficulties securing permission to operate, and the longstanding UNHCR project to monitor and assist arrivals from the Horn of Africa ended in June 2017. The anti-migrant policies being adopted by on-the-ground forces have coincided with a resurgence in the practice of smugglers forcibly disembarking migrants from boats along the southern and eastern coasts. In August 2017, 280 Ethiopian and Somali migrants were forced into the sea by smugglers, resulting in the deaths of more than 70 of them. This practice, intended to avoid encounters with Yemeni authorities, appeared to have slowed after thousands of drownings between 2008 and 2010, as smugglers were able to bribe coast guards and collaborate more profitably with trafficking gangs in Yemen. However, increasingly anti-migrant attitudes by actors in Yemen have caused this collusion between smugglers and border enforcement authorities to break down. After a lull in recorded (and almost certainly underestimated) maritime deaths after 2010, the rate appears to have begun climbing again, with more than 150 recorded drownings in four of the past five years. Despite the expectation that the raging civil war would cause a drop in arrivals from the Horn of Africa to Yemen—an outbreak of fighting between Saudi and Houthi forces in 2010 coincided with a reduction in maritime arrivals—the opposite has been the case. An initial decline in arrivals following the outbreak of civil war in March 2015 was followed by a record 117,000 arrivals in 2016. This record will likely be broken again in 2018, with the International Organization for Migration’s (IOM) Displacement Tracking Matrix (DTM) estimating 150,000 arrivals for the year. Sources: Olivia Akumu, "Shifting Tides: The Changing Nature of Mixed Migration Crossings to Yemen," Mixed Migration Centre article, May 13, 2016, available online; UNHCR, "Arrivals in Yemen 2010 - 2013 (as of 31 January 2013)," fact sheet, UNHCR, Geneva, February 2013, available online; UNHCR, "New Arrivals in Yemen Comparison 2013 – 2016," fact sheet, UNHCR, Geneva, February 2016, available online; International Organization for Migration (IOM), Mixed Migration in the Horn of Africa and in the Arab Peninsula (Nairobi, Kenya: IOM Regional Office for the East and Horn of Africa, 2017), available online. The collapse of law and order has given free rein to smugglers in the region, while also acting as a pull factor attracting migrants with the allure of undetected transit through Yemen and on to Saudi Arabia and the Gulf countries. IOM surveys have suggested that most migrants transiting through Djibouti are aware of the conflict, but do not believe it will affect them. Similarly, a 2017 study by the MMC on attitudes of Ethiopian migrants suggests that knowledge of risks along the journey does not deter migrants. While total arrivals have increased, the number of new (primarily Somali) refugees in Yemen has fallen each year since 2012 (see Figure 2). The decline in Somali migrants seeking refuge in Yemen is likely due to the improving political situation in Somalia, the anti-migrant policies outlined above, and a breakdown in the asylum process as the Yemeni central state has fractured. As a result, 99.9 percent of migrants tracked by IOM in Yemen in 2017 intended to journey on to Saudi Arabia. Beyond causing flows from the Horn of Africa to increase in magnitude, the conflict apparently has also affected the choice of route taken. While the majority (69 percent) of recorded crossings took the Red Sea route between 2009 and 2013, the Gulf of Aden channel has grown in popularity since 2014 and was the site of 85 percent of crossings in 2015 and 64 percent in the first quarter of 2016. This shift appears to be due to in part to increased abuse by smugglers along the Red Sea route, including kidnappings for ransom. In addition, the intense fighting and increased risk of detention by military patrols along Yemen’s western coast has led to reports of arrivals being hit by air strikes or forcibly disembarked before landing. The reports of migrants arriving in Yemen appear to have been channeled back to their place of origin, with the resultant feedback loop causing the bulk of departures to shift to Bossaso. Note: Data for 2016 and 2017 are from the first quarter only. Sources: Bram Frouws and Olivia Akumu, RMMS Briefing Paper 1: Pushed and Pulled in Two Directions (Nairobi, Kenya: Regional Mixed Migration Secretariat [RMMS], 2016), available online; RMMS, “Mixed Migration in the Horn of Africa & Yemen Region: January 2017,” accessed December 20, 2018, available online; RMMS, “Mixed Migration in the Horn of Africa & Yemen Region: February 2017,” accessed December 20, 2018, available online; RMMS, “Mixed Migration in the Horn of Africa & Yemen Region: March 2017,” accessed December 20, 2018, available online. As flows from the Horn of Africa to Yemen have grown, migrants of various nationalities have fled Yemen in the opposite direction. This has resulted in unique, two-way movements, with migrants passing each other in opposite directions in the transit town of Obock in Djibouti. Most humanitarian migrants from Yemen left in the first year of the war, with more than 86,000 maritime crossings into the Horn of Africa taking place between March 2015 and April 2016, rising to 95,000 by April 2017. Somalia, Djibouti, Ethiopia, and Sudan have been the main destination countries. The majority of these migrants have been national returnees, followed by Yemenis and other nationalities. Saudi Arabia and Oman have also received large numbers of arrivals since the conflict began. Finally, a new migration route used exclusively by Somali youth appears to have emerged since the end of 2015. The route reportedly crosses the Gulf of Aden from towns in the proximity of Bossaso in Somalia to Mukallah in Yemen, overland to Yemen’s western coast, and on by sea to Sudan, before continuing to Libya, Egypt, and Europe. While it is unclear if the emergence of this route is linked to the war, it may be a result of the increased difficulty of claiming asylum in Yemen since the war began—and concurrent fall in new Somali refugees—as well as the barriers facing those transiting on to Saudi Arabia. As the war in Yemen continues and the humanitarian crisis grows, migration dynamics in the region continue to receive relatively little international policy attention. The dangers experienced by migrants on the Eastern route have been amplified by the conflict, along with increasingly hostile policies toward migrants adopted by regional actors. These policies, in combination with complex, multidirectional flows that have arisen as a result of the war, are posing greater challenges for organizations seeking to monitor and provide support to migrants in Yemen. On a broader level, these flows challenge several commonsense assumptions about mixed migration dynamics. While the outbreaks of fighting in 2010 and 2015 coincided with temporary lulls in maritime arrivals to Yemen, expectations that the war would deter migration have been largely confounded. Instead, widespread conflict and the concurrent breakdown in law and order have acted as pull factors, inducing record levels of migration. This dynamic may have implications for other conflict-spurred migration situations. In addition, concerted and large-scale deportation campaigns by Saudi Arabia do not appear to have deterred Ethiopians from making the journey through Yemen to find work in the Gulf, an important finding for governments in Europe and the United States experimenting with increasingly hard-edged policies to deter irregular arrivals. Finally, as detailed by the IOM and MMC, the knowledge of migration risks does not necessarily deter high-risk migration practices, a key finding that should inform regional migrant-protection strategies centered around education and information campaigns. Taken together, these findings point to the complex interaction of factors that drive mixed-migration flows and suggest that high-level mixed flows through Yemen are likely to continue as long as instability lasts, posing unique protection challenges for governments and international organizations. Associated Press. 2017. Ethiopians Deported En Masse by Saudi Arabia Allege Abuses. Associated Press, December 28, 2017. Available online. Copper-Ind, Christopher. 2018. Saudi Exodus as 2 Million Expats Arrested in 12 Months. International Investment, November 21, 2018. Available online. Davy, Deanna. 2017. 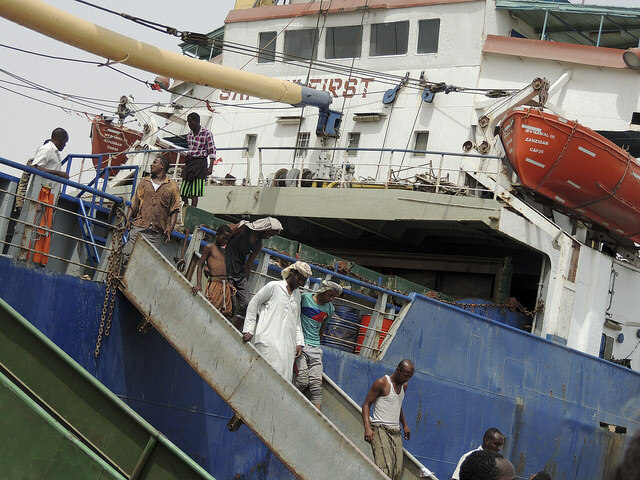 RMMS Briefing Paper 6: Unpacking the Myths: Human Smuggling from and within the Horn of Africa. Nairobi, Kenya: Regional Mixed Migration Secretariat (RMMS). Available online. Frouws, Bram and Olivia Akumu. 2016. RMMS Briefing Paper 1: Pushed and Pulled in Two Directions Nairobi, Kenya: RMMS. Available online. Hooper, Kate. 2016. Unauthorized Maritime Migration in the Gulf of Aden and the Red Sea. In All At Sea: The Policy Challenges of Rescue, Interception, and Long-Term Response to Maritime Migration, eds. Kathleen Newland, Elizabeth Collett, Kate Hooper, and Sarah Flamm. Washington, DC: Migration Policy Institute. Human Rights Watch. N.d. Ethiopian Protests. Accessed December 20, 2018. Available online. ---. 2009. Hostile Shores: Abuse and Refoulement of Asylum Seekers and Refugees in Yemen. New York: Human Rights Watch. Available online. ---. 2017. Yemen: Attack on Refugee Boat Likely War Crime. Article, March 26, 2017. Available online. ---. 2018. Yemen: Detained African Migrants Tortured, Raped. Article, April 17, 2018. Available online. International Organization for Migration (IOM). 2018. IOM Raises Protection Concerns as 2018 Migrant Arrivals to Yemen Approach 150,000. Press release, December 4, 2018. Available online. ---. 2018. Mixed Migration in the Horn of Africa and in the Arab Peninsula: June - December 2017. Nairobi, Kenya: IOM Regional Office for the East and Horn of Africa. Available online. Mixed Migration Centre (MMC). 2016. Shifting Tides: The Changing Nature of Mixed Migration Crossings to Yemen. Article, May 13, 2016. Available online. ---. 2017. New Trend/Old Tactics: War Revives Brutal Smuggler Practices in the Gulf of Aden. Article, September 12, 2017. Available online. Reliefweb. N.d. Ethiopia: Drought - 2015-2018. Accessed December 20, 2018. Available online. Regional Mixed Migration Secretariat (RMMS). 2014. Blinded by Hope. Knowledge, Attitudes and Practices of Ethiopian migrants. Nairobi, Kenya: RMMS, June 2014. Available online. ---. 2017. Mixed Migration in the Horn of Africa & Yemen Region: January 2017. Available online. ---. 2017. Mixed Migration in the Horn of Africa & Yemen Region: February 2017. Available online. ---. 2017. Mixed Migration in the Horn of Africa & Yemen Region: March 2017. Available online. Spagna, Guilia. 2017. RMMS Briefing Paper 5: Weighing the Risks. Nairobi, Kenya: RMMS. Available online. United Nations High Commissioner for Refugees (UNHCR). 2013. Arrivals in Yemen 2010 - 2013 (as of 31 January 2013). Fact sheet, UNHCR, Geneva, February 2013. Available online. ---. 2016. New Arrivals in Yemen Comparison 2013 – 2016. Fact sheet, UNHCR, Geneva, February 2016. Available online. --- N.d. Yemen Emergency. Accessed December 12, 2018. Available online. ---. N.d. Yemen: Regional Refugee and Migrant Response Plan. Accessed December 20, 2018. Available online.